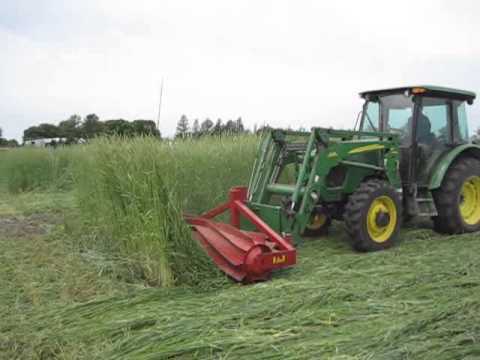 Tillage is the manipulation of the soil into a desired condition by mechanical means; tools are employed to achieve some desired effect (such as pulverization, cutting, or movement). 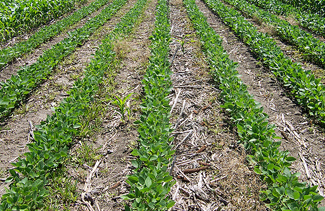 Soil is tilled to change its structure, to kill weeds, and to manage crop residues. Soil-structure modification is often necessary to facilitate the intake, storage, and transmission of water and to provide a good environment for seeds and roots. Elimination of weeds is important, because they compete for water, nutrients, and light. Crop residues on the surface must be managed in order to provide conditions suitable for seeding and cultivating a crop. Some farmers use machines like a plow or disc to turn over and loosen the soil after harvest (a process called tillage). This can leave the soil exposed to rain and wind, which can sometimes lead to erosion (wearing away) of the topsoil that is needed to grow a crop. This is a technique for planting seed that minimizes the disruption of soil and therefore helps prevent soil erosion. 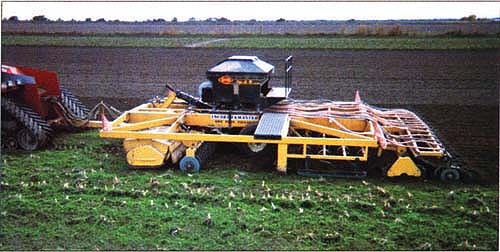 Farmers use special equipment to plant seeds, leaving most of the residues (e.g. stalks) of the previous crop intact. Planting in this way allows the crop residue to break down, which adds organic matter (like composting) while protecting the soil from erosion. No-till works in the same way as conservation tillage, but there is less disruption of soil (e.g. the planter does not go as deep into the soil to plant the seeds, and no crop residue is turned over).No-till practices are used in 56.4 per cent of all area prepared for seed in Canada. Equipment used to break and loosen soil for a depth of six to 36 inches (15 to 90 centimetres) may be called primary tillage equipment. It includes moldboard, disk, rotary, chisel, and subsoil plows. Deep ploughing turns out large sized clods, which are baked by the hot sun when it is done in summer. These clods crumble due to alternate heating and cooling and due to occasional summer showers. This process of gradual disintegration of clods improves soil structure. The rhizomes and tubers of perennial weeds (world’s problematic weeds viz., Cynodon dactylon and Cyperus rotundus) die due to exposure to hot sun. Summer deep ploughing kills pests due to exposure of pupae to hot sun. A deep tillage of 25-30 cm depth is necessary for deep rooted crop like pigeonpea while moderate deep tillage of 15-20 cm is required for maize. Deep tillage also improves soil moisture content. However the advantage of deep tillage in dry farming condition depends on rainfall pattern and crop. It is advisable to go for deep ploughing only for long duration, deep rooted crops. Depth of ploughing should be related to the amount of rainfall that it can wet. Hard pans may be present in the soil which restrict root growth of crops. These may be silt pans, iron or aluminium pans, clay pans or -man-made pans. Man-made pans are tillage pans induced by repeated tillage at the same depth. Root growth of crops is confined to top few centimetres of soil where deep penetration of roots is inhibited by hard pans. For example, cotton roots grow to a depth of 2 m in deep alluvial soil without any pans. When hard pans are present, they grow only up to hard pan, say 15-20 cm. Similarly, vertical root growth of sugarcane is restricted due to hard pans and it is not compensated by horizontal spread. Subsoiling is breaking the hard pan without inversion and with less disturbance of top soil. A narrow cut is made in the top soil while share of the subsoiler shatters hard pans. Chisel ploughs are also used to break hard pans present even at 60-70 cm. The effect of subsoiling does not last long. To avoid closing of subsoil furrow, vertical mulching is adopted. Tillage operations carried out throughout the year are known as year-round tillage. In dry farming regions, field preparation is initiated with the help of summer showers. Repeated tillage operations are carried out until sowing of the crop. Even after harvest of the crop, the field is repeatedly ploughed or harrowed to avoid weed growth in the off season. 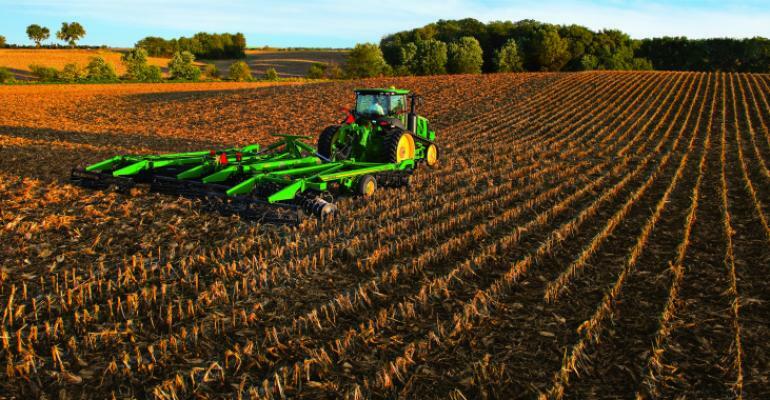 Secondary tillage, to improve the seedbed by increased soil pulverization, to conserve moisture through destruction of weeds, and to cut up crop residues, is accomplished by use of various types of harrows, rollers, or pulverizers, and tools for mulching and fallowing. Harrowing is done to a shallow depth to crush the clods and to uproot the remaining weeds and stubbles. Disc harrows, cultivators, blade harrows etc., are used for this purpose. Planking is done to crush the hard clods to smoothen the soil surface and to compact the soil lightly. Thus the field is made ready for sowing after ploughing by harrowing and planking. Generally sowing operations are also included in secondary tillage.